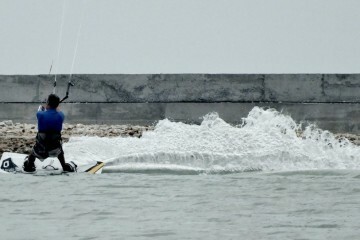 The life of a kitesurfer is most definitely something worth documenting. 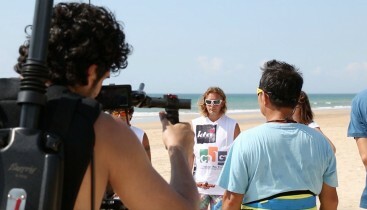 Last week wasn’t the first time a film crew has come to visit the kite surfers in Hainan. The DJI film producers are hanging around the kite school so much, they’ve almost become part of the beach. The crew that arrived last Monday afternoon was comprised of a couple of twenty-something English lads, definite “film types” by anyone’s standards; and a handful of Chinese women of indeterminable age (see that’s the thing about Chinese women, isn’t it? They all look twenty until they’re fifty, then they look about a hundred and eight.). Now, I’ll be the first to admit that I’m a technological imbecile. I’d love to tell you about the time I worked myself up into a paranoid rage because I confused my new iPhone’s very standard GPS with some kind of espionage tracker device, but that story really deserves its own post… If you are anything like me, you aren’t already familiar with the world of super high tech gadgetry; DJI are- wait for it- drone manufacturers. They paid us a visit several months back and a few of the Kitesurf China team members were featured in their last promo video. Naturally, you know, because we are awesome, it wasn’t long before they were back, this time around to make a short film about the positive impact drones can have on our kite surfing experiences- which in fact it did. Day 1 of the shoot started at 8.30am with the standard sceptical, sideways glances and pursed lips that often follow the announcement that any sort of “organized event” will take place in China. As amazing and rewarding as many of us Westerners find living here, it has to be said that our cultural differences- which tend to manifest at the least convenient of times, namely, times that we count on everything to be ‘well organized’ by international standards- can often leave us with little bald patches where our hair used to be. A film set is a chaotic mess even at the best of times. You could have Scorcese directing, a 24 year old Brad Pitt acting, a $50 million budget, and stylists straight from Milan Fashion week; but your set would still look like it had been in a bar fight with Tyler Durden’s coked up older brother during Hurricane Katrina. We had a handful of Chinese tai-tais flying drones, 2 metro sexual Bromley boys decked head to toe in Topshop; not one trained actor between us (just our charming, kite clad selves); and obviously no stylists to speak of- they would have been lucky if all of us even showed up to the shoot showered. Now try to imagine how our film set looked. Needless to say, over the course of the three day production tensions escalated. Everyone found a way to push each other’s buttons in the most skilful of fashions. Mostly, we were annoyed because we were not allowed to be ourselves. Apparently, alcohol, cigarettes and bikini clad girls are not part of the DJI “image”, which we understood and respected. Mostly, the Chinese Producer was annoyed because our “colourful off camera language” combined with our “intimidating” foreigner stature offended her to the point that on Day 2 of the shoot, she actually didn’t show up. As any well mannered/respectful foreigner in China or any country for that matter should, I always make a contstant effort to be mindful of cultural relativity. However, in my humble opinion, it is rather culturally insensitive of anyone to tell an Irish person that they cannot curse. Don’t they understand that cursing is a crucial part of our language, and absolutely essential in expressing, well, basically anything?? Without cursing, I’m nothing but a stuttering mess of disjointed nouns, and hence completely unable to communicate. Now it’s not that we didn’t try to correct our “offensive” language, it was a solid attempt. Eventually I suggested we compile an official list of approved vocabulary, as I was unsure if adaptations such as ‘feck’ or ‘shite’ also fell into the category of the unholy. This was the last time the subject was broached. Lots of raised eyebrows and low digs continued to be exchanged in effort to vent the growing frustration of trying to put together a project of this nature. But despite the apparent social/cultural/lifestyle differences between Chinese film producers and Western kite surfers, in the end there were a lot of unexpected rewards produced through our symbiotic efforts. For one, we all got to see a really different side to Boao. We spent the days covering all corners of the town, from our usual home at the kite surfing beach, to little boho youth hostels, and tuk-tuk journeys into the farming communities deep in the palm forests (if this blog had greater editorial oversight I’d love to tell you the story about the farmer with the lazy eye who stood next to our set masturbating for the best part of half an hour, but I imagine it won’t get past our rigorous PG-13 screening test). After Day 2 of filming a couple of us had the pleasure of sitting down for a few beers with the Bromley Boys (I’m taking some editorial initiative here, God I hope that name sticks). Lucky us, we got a quick look at the some of the footage captured that day. If there is anything we were made blatantly aware of at that point, it’s the following: 1) absolutely anything in the entire world can be made awesome by filming it in slow motion, and adding obscure background music; and 2) we incontestably live in one of the most magical places in the world. The drone footage was completely unreal. Bird’s eye shots of Boao, from the thick palms, through the rice paddies, along the winding jungle roads all the way to the beach showed our little paradise in all its HD glory. It’s so easy to forget what you have, isn’t it? Especially when it’s right on your doorstep. 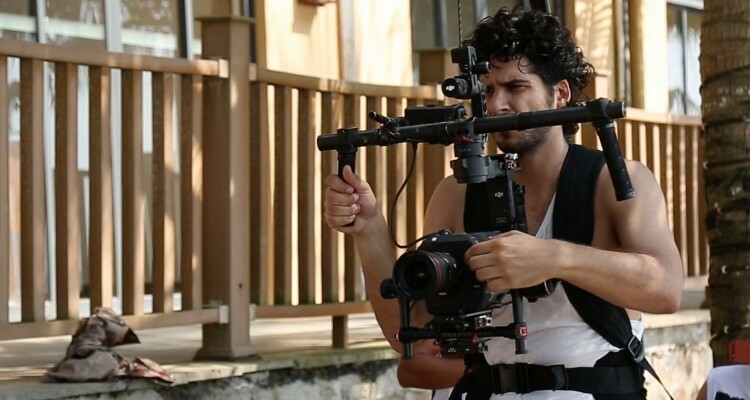 It won’t be totally apparent until the video actually comes to fruition, but I think it’s safe to say both the kiters and the film crew had plenty to learn from each other, which in turn positively impacted the outcome of the three day shoot. 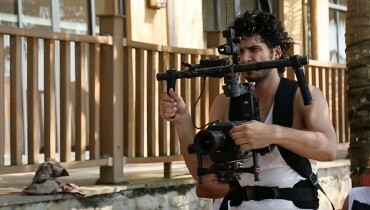 One of the final scenes was a series of interviews with the students. I guess the directors were hoping to film some relaxed, candid conversations to capture the genuine passions of the kiters- and from the brief clips we managed to glimpse that evening, that’s exactly what they got. The crew seemed genuinely impressed with how relaxed and engaging all of us Hollywood-averse surfers could be on camera. “Well, duh”, we all said, “That’s because we are like that”. No one had to pretend to feel anything, it had in truth been an exceptional experience for us. DJI, by all accounts, accomplished just what they set out to do. Not only did they successfully film the movie, but they also managed to convince the kite surfers that drones can and should be an integral part of our lifestyle. At the time of the shoot, Asia Bay was host to riders of all different levels of experience, all of whom were given access to the project. 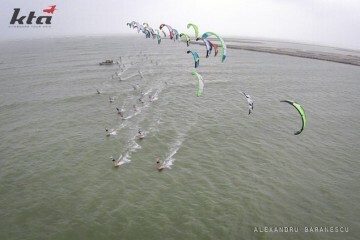 The drones followed the kiters from their launch on the beach all the way out on the water while they rode. Beginners got the chance to sit down with their instructors when the day was over and watch close up HD footage of themselves practicing water starts and riding style. Not just that but they also had the option to pause the video, point out mistakes, and talk in detail on a one-to-one basis about how to progress from there. But here’s the kicker, there were a few guys there who have been kiting for almost as long as the sport has existed- but naturally had never been able to watch themselves like this before. While it might not have felt so rewarding to be asked to perform the same unhooked trick 15 times in a row so the camera could get the perfect shot, what happened next made it all worth it. Just as easy as it was for us to forget how unbelievably beautiful Boao is until we saw the professional drone footage, so easy it also was for these guys to forget how mind bogglingly amazing it is to kite surf. As a newbie, every time I am watching people kite from the beach I am blown away, because it’s still brand new to me, the whole concept of actually riding the wind is fresh in my mind. Sure, it doesn’t become any less amazing the more experienced you become, but it does become commonplace, and our human condition makes it almost impossible to fully appreciate the things that we consider ordinary. I watched the riders watch themselves; the look on their face made it clear that they were falling in love all over again. That in itself is something completely priceless. All that’s left now is to wait for the pros to put the final product together, we can’t wait to see how it turns out.